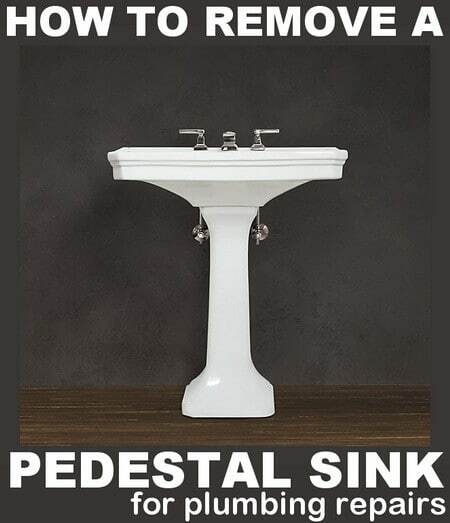 The difficult issue with pedestal sinks when you need to repair or remove plumbing, is that the plumbing, tubing, and PVC drain is hiding behind the pedestal. This leaves hardly any room to get your tools back in there to remove and fix plumbing issues. Question: Do I need to be remove the sink from the wall and then have to repaint since pulling it from the wall? I don’t see any toggle bolts holding it up and no kind of bracket. I hope that it is just caulked to the wall and actually supported by the pedestal. Can you give me some guidance to remove this with the least amount of effort? Answer: The bottom portion of a pedestal is usually not bolted down. In most cases the sink portion is held in place by a wall bracket and the pedestal portion is held in place by its weight and a bead of caulk at the bottom. To remove the pedestal sink to gain access behind it, remove the caulk under the sink bowl and the caulk near the bottom stand at the floor. After this, carefully lift up the sink and slide the pedestal out. The sink bowl is usually attached on the wall mounted on a bracket and by simply lifting up on the sink it will detach from the wall. The only thing keeping the pedestal on the bottom of the sink is the weight of the sink. Lift the sink about a 1/2 inch off pedestal while having someone else slide the pedestal out and then put the sink back onto the wall bracket. This will give you all the room you will need to repair or fix any plumbing or draining issues. Alternative Method: You can try to replace the drain without removing the sink. This will save you from having to remove the sink and pedestal but will be more difficult as there is really no room for the wrench to turn to remove the plumbing. You could try to purchase special plumbing tools that have a shorter handle or tools that are made to gain access to tight spots. Do you know of an easier method to get behind a pedestal sink to perform plumbing repairs? Please leave a detailed comment below to assist our other readers needing help. An alternative method to replacing a drain without removing a sink. My sink seems like it would be pretty tough to remove on my own, so I would rather do something else to replace my drain. It’s a good thing that you pointed out that there are special plumbing tools that have a shorter handle for easier access to tight spots. I don’t have any tools like that, so it seems like it would be worth my while to grab the tools that I’ll need at a hardware store. I’ll be sure to ask for tools that are made to fix drains that are specially made for working in tight spots. Thanks for the tips! Thanks for the information! I’ve been trying to figure out how to fix my pedestal sink. A friend of mine told me that I have to remove it from the wall so that I can have the plumbing repairs done that I need. It’s helpful to know how I can remove my sink from the wall without damaging the wall it’s attached to. I didn’t know that there’s a way to fix my plumbing without removing the sink. I’ll be sure to try this method so that my wall won’t end up being damaged.